Through Habitat for Humanity's Partnership with the Habitat Home Inspections, your home inspection fee can benefit Habitat at no additional cost to you. First, choose a Habitat Home Inspections as your home inspector. 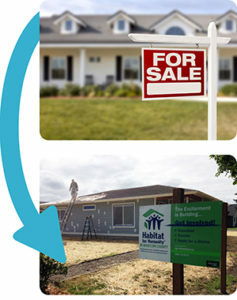 Once your inspection is complete, Habitat Home Inspections donates a portion of their home inspection fee to Habitat. Fill out the form below and someone from the Habitat Home Inspections will contact you. Thank you for helping us build strength, stability, and self-reliance through shelter.